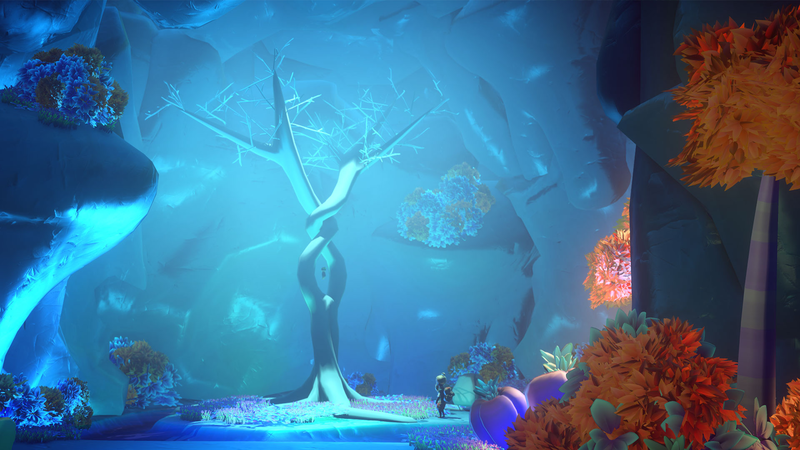 Some games are no-holds-barred, adrenaline-filled thrill rides full of action and danger, and then there are games like Yonder. It has none of that; in fact, there is no combat whatsoever. At first, I found that mind-blowing, but after sinking a lot of time into it, I realized that it doesn’t need any of that stuff. The point of this game isn’t to wow you with action, it’s to calm and relax you, and somehow, it still manages to wow you in the end. In a market full of insanely over the top action, gore, and fear filled games these days; Yonder is an excellent escape. You wash up on an island your magic compass points you towards, and for some reason, that means it’s time to start your very own farm! The story isn’t the deepest you’ll find in a video game, but this game wasn’t shooting for a gripping plot. 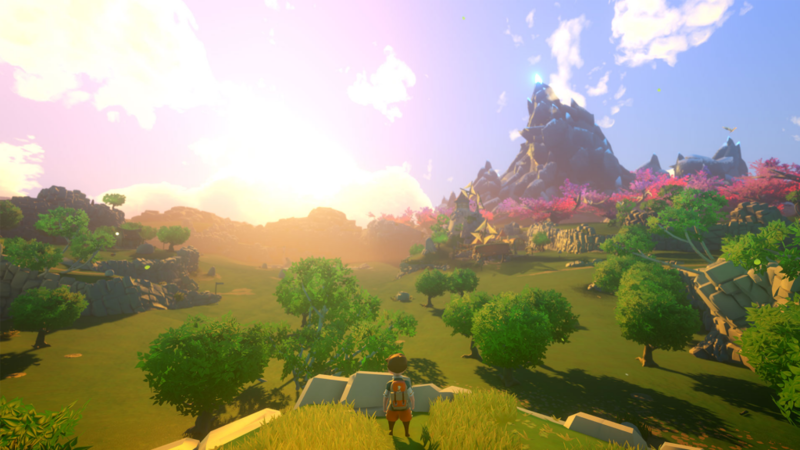 Exploration plays a massive part in Yonder, and the island is a treat to experience. As you explore you find sprites which work like living keys. Collect enough, and you unlock more areas. Each of the Eight significant regions of the game will provide you with a new farm, new gatherable items, a new town in which to trade those items in it, and last but not least, a plethora of new quests. The sights and sounds match the tone and gameplay perfectly. Yonder is a game that knew exactly what it wanted to be when it grew up and nailed it on the head. That moment you leave the starting caves and enter into the beautiful green rolling hills with breathtaking mountains and monuments far off in the distance is one that will leave a lasting impression long after the game is done. It has a beautifully simplistic style that’s immensely pleasing on the eyes and ears. Each area is a unique environment that changes with the seasons. The lighting is probably the best I’ve ever seen in a game, and its use is deliberate, informational, and just downright jaw-dropping. There is no currency in Yonder; instead, you trade goods that are worth a specific amount to that particular trader for an item they have. When they’re happy that the items are of equal value, they give their ok to trade. Crafted or farm-produced items usually go for a lot more than the junk lying around the fields. A particular item may do better in one area of the island than another, depending on what is abundant and what is scarce. This encourages players to put in a little effort to get what they need. The game consistently delivers, and has a lot of great ideas, but struggles in fleshing them all out completely. It wants to be a simplistic game that anyone, regardless of age, can enjoy. The problem is that it ended up being a little TOO simplistic, and felt like it never quite reached its full potential. Graphics are amazing, with the exception of the character designs. They look a bit cheap, and the animation is somewhat stiff and awkward. Quests are never more than simple fetch quests, making them tedious quick. The controls are so simple that half the buttons go unused, and when they are used, they don’t always give the best results. Ironically, they could’ve made cycling through the tools a little easier by making you automatically whip out the tool you need when you need it. Instead, you’re left mashing the same button over and over to find the tool you’re looking for. Frame rate issues were also a minor annoyance, but all of these points aren’t enough to harm the game. If you’re a fan of Animal Crossing, Harvest Moon, or maybe even Stardew Valley (minus the combat), then this is the perfect game for you. I enjoyed it immensely, even ended up putting more time into it than expected. I suppose my only real complaint is that I want more! More things to do, more customization and job options for the farm, maybe even some city building! I didn’t mind that there wasn’t any combat and found myself feeling very peaceful after each visit to the island. Considering what you get for the asking price, there isn’t a reason to say no. Take a break from shooting people in the face, go farm a little; you’ll be glad you did. Yonder gets 7 Pokemon wannabe sprites out of 10. Next Transformers #1 Review: The Beginning of the End!